Pad thai is a simple Asian dish that originated in Thailand. It is commonly served as street food, but it’s also a popular restaurant dish. Some people think you can only get good pad thai when you go out to a Thai restaurant, but you can actually make delicious pad thai right at home. If you’re tired of making the same few things for dinner, it’s time to shake it up! This pad thai with eggs recipe combines lots of amazing flavors to create one tasty meal. The crisp vegetables, savory noodles, and tangy sauce come together for its distinct taste. The eggs add a dash of protein. You’ll get a helping of many foods, all in one dish. If you’re looking for a delicious new meal to make for dinner soon, you’ll love our spicy pad thai recipe. Prepare the peanuts. Put the peanuts in a food processor and pulse a few times. Chop the peanuts into small pieces but not so much that they become a powder. Set it aside. Prepare the sauce. Heat a small saucepan over medium or medium-low heat. Add the tamarind concentrate, water, palm sugar, fish sauce, and minced garlic. Let it heat until the palm sugar has completely dissolved. Taste the sauce. If you want it to be sweeter, add more palm sugar. If you want it to be tangier, add more tamarind. When adjusting the taste, only add a tiny bit at a time. Once it reaches its desired taste, set it aside and let it cool. If you don’t want to make the sauce yourself, you can also substitute in store-bought pad thai sauce. Beat the eggs in a small bowl. Add the garlic powder, salt, and black pepper. Set it aside. Heat the oil in a skillet. Add the bean sprouts, baby corn, green onions, mushrooms, red peppers, and red pepper flakes. Saute until tender and fragrant. Add the eggs. Cook until they are no longer liquidy but still moist. Add the noodles and pad thai sauce. Toss all of the ingredients until fully heated and well-combined. 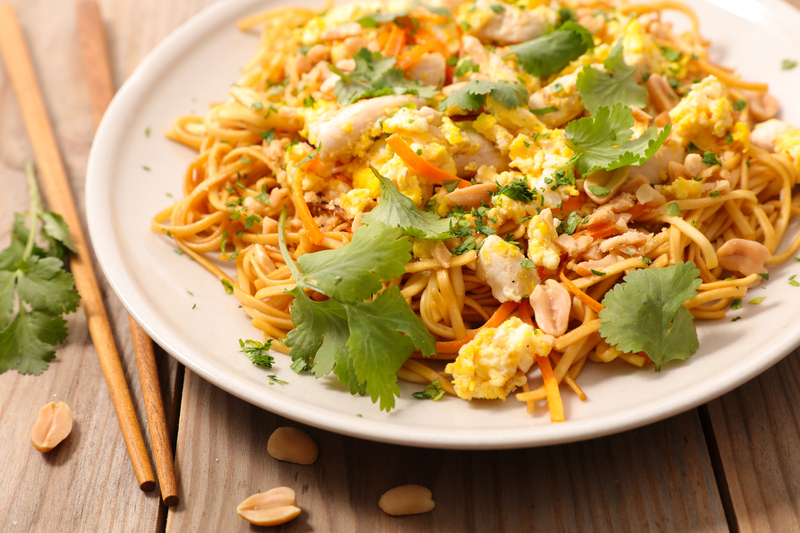 When you cook this spicy pad thai recipe, be sure to use Sauder’s eggs. We only provide eggs of the highest quality and freshness, so you can prepare delicious, healthy meals for yourself and your family. To find Sauder’s eggs at the nearest store to you, please use our store locator today.